but you feel helpless to change it. You feel like it’s out of your control, and every day seems further and further from the experience of life you wish you could have. You feel like there’s nobody else in the world who can do a single thing to make your pain go away...And you’re right. There’s nobody else in the world who has the power to make your life better. To Empower Your Life to the best version possible. You have all the power you need to make your life a masterpiece. You just need the right tools to tap into that power. In this ground breaking program, you will learn how to redirect and empower your life toward the future you’ve always dreamed of. A year from now, you will be in a much different place – professionally, personally, financially, spiritually and in many other ways – than you would have been otherwise. And that’s my guarantee, backed up by shared experiences of thousands of people who have changed their lives by taking The Self Empowerment Pledge. Learn how to harness your mind so that you can spend every waking hour creating your dream life! All this backed by our guarantee! If this program has not made a positive impact on your life, we’ll credit your money back. 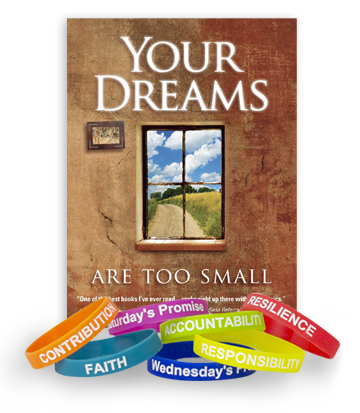 All we ask is that you pass on the wristbands to someone else who needs the power of self empowerment.